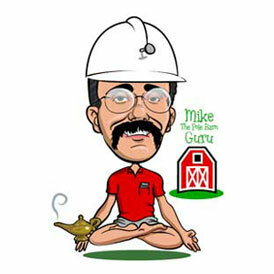 Today the Pole Barn Guru discusses Rebar hairpins, a bigger build, and cutting corners on the construction process. d) The site has not been properly prepared to accept the concrete slab. In order to meet the design requirements of the engineer of record, the hairpins are a necessity. P.S. Every slab is going to crack, it is properly controlling the cracks which makes for a good pour. By using zip strips, expansion joints or saw cuts no more than every 12 feet for a nominal four inch thick floor, cracking can be localized to these points. DEAR TJ: I know this is difficult to believe, but you are the first person to ever have this problem. No, not really, it is a common occurrence and I have been guilty of it personally. Whatever one constructs, it seems the possessions increase to fill the available space plus 10%. 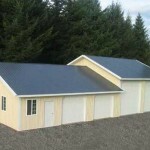 We can have designed for you an addition to increase your building length. Your Hansen Pole Buildings’ Designer will be in contact with you before the weekend. 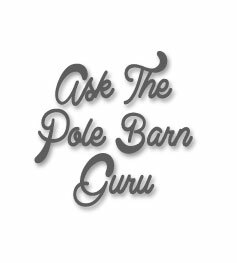 DEAR POLE BARN GURU: My builder did not use the tape to seam my insulation. Short of removing the entire roof, can I tape seams from bottom and be ok? Is the taped seams purpose to stop heat and cold air from clashing to create moisture or is it to catch moisture that is going to accumulate no matter what? DEAR TALMADGE: It is aggravating when builders are in such a hurry they neglect to do simple thing such as using the adhesive, which is on the reflective radiant barrier tab already, to seal the barrier seams. All it would have taken was to peel off the pull strip! You can tape the seams from the bottom, which is going to be a lot of work and which your builder should offer to do for you at no charge. In order for the reflective radiant barrier to function properly, it needs to create an air tight barrier between warm moist air inside of your building and the cooler roof steel. 1-1/4 inch long stitch screws were furnished to attach the ridge cap, as well as corner and rake trims. They should be plenty long enough. 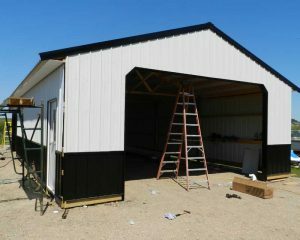 This entry was posted in Insulation, Pole Barn Questions, Pole Barn Design, Steel Roofing & Siding, Footings and tagged stitch screws, Concrete, adhesive tape, Hairpins, larger building, adhesive on September 10, 2018 by admin. 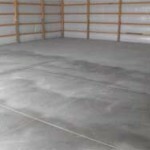 Cost Savings of a Crawlspace vs a Slab! DEAR FLOYD: You asked for my honest opinion – here it is. I wouldn’t stand under or near your building as proposed in a wind or snow storm. 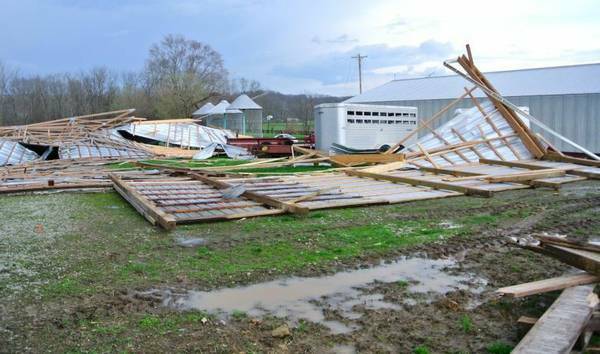 With a 30 psf (pounds per square foot) roof snow load and a 100 mph design wind speed under the 2009 IBC (International Building Code) you are talking about some significant loads to be dealt with. My best recommendation is to spend the money to have your proposed design reviewed by a RDP (registered design professional – engineer or architect) who can make the necessary revisions so you can end up with a building which will actually stand up under the imposed loads. DEAR DOUG: I am with you when it comes to concrete work – I just won’t go there if I can at all help it! 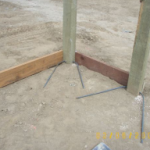 Crawl spaces for post frame buildings are most normally elevated above grade. The IBC (International Building Code) requires any not pressure preservative treated beams in a crawl space to be at least 12 inches above the underlying soil, and joists to be 18 inches above. Think of the raised wood floor being created as a “loft” floor, with the beams attached to the columns and joists running between the beams. The difference being this loft floor is usually going to be somewhere 18 to 36 inches above grade (most people prefer their crawl spaces to be tall enough to actually allow easy access for running utilities). DEAR DUNCAN: Although we are not manufacturers or resellers of just trusses, I can give you some guidance as to information which will be needed in order for you to get a correct price. The easiest thing will be to get a copy of your engineered building plans into the hands of the local truss providers. 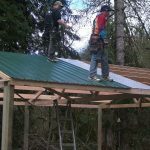 The plans will have the information required to give you an accurate price for the trusses, as well as insuring they will be designed to meet the loading conditions necessary for your particular building, at your site. These items will include jobsite address, Roof Exposure Factor (to the wind, also known as Ce), the ground snow load (Pg), the sloped roof factor (Cs), the thermal factor (Ct) as well as the Importance factor (I). The type of roof materials being used as well as if there is a ceiling or not will also play into the end truss design. If your local Building Department has a minimum roof snow load requirement, this needs to be passed along as well. With all of the above in hand, the truss designer can plug the variables into the computer program which does truss design and derive a price for your truss package. 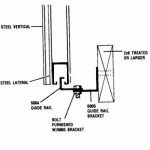 This entry was posted in Building Styles and Designs, Roofing Materials, Trusses, Footings, Budget and tagged Concrete, windload, crawlspace, roof exposure on December 12, 2016 by admin. I know none of us has ever experienced this condition, but we all know of someone who has had the hurling issue, often after a period of personal discussion with some of the friends of George Thorogood. In this instance, I’m not thinking either of the example above, or the tasty oatmeal raisin cookies my grandma made for us when we were kids. 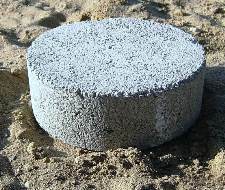 I am making specific reference to the pre-cast chunks of concrete usually four to six inches in thickness and 12 to 18 inches in diameter which are sold or provided for footings in pole buildings. The basic concept is to throw concrete cookies in the bottom of the augered holes and place the building columns directly upon them. The general idea is for the cookies to support the weight of the building, to prevent settling. My recommendation – RUN, DO NOT WALK, away from this as a design solution. They are a failure looking for a place to happen. Let’s look at what a footing is supposed to do. The dead weight of the building PLUS all imposed live loads must be distributed to the soils beneath the building. Sounds pretty simple, eh? To begin with, the International Building Codes require concrete footings to be a minimum of six inches in thickness. This eliminates immediately any concrtete cookies which are less than this thickness (most of them). 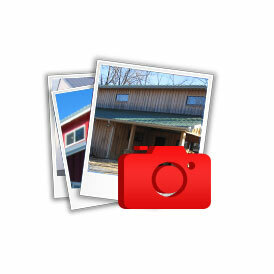 Examine a fairly small example – a 30’ wide building with columns spaced every eight feet. 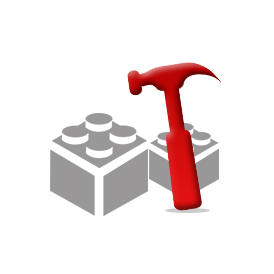 The actual weight of the building (dead load) will vary greatly depending upon the materials used. 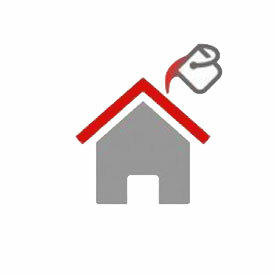 Steel roofing and siding will be lighter than shingles and wood sidings. For the sake of this example, we will use a fairly light 10 psf (pounds per square foot) building weight. 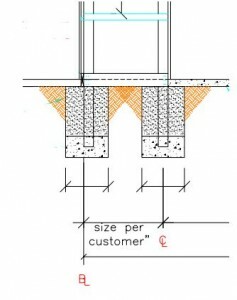 The Code specifies a minimum roof live load of 20 psf. This means each footing must carry the weight of one-half of the width (15 feet) times the column spacing (8 feet) times 30 psf. Doing the math, 3600 pounds. In many parts of the country soil bearing pressures are as little as 1500 or even 1000 psf. 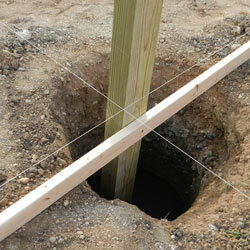 Basically – the easier it is to dig, the lower the capacity of the soil to support a vertical load. For every foot of depth below grade, the soil capacity is increased by 20%. Other than with 1000 psf soils, for every foot of width over one foot, the capacity also gets a 20% increase. With 1500 psf soil, and the bottom of the footing four feet below grade, a 12 inch footing will support 2700 pounds per square foot. A 12 inch diameter footing covers 0.785 square feet, a 16 inch 1.4, 18 inch 1.77, 24 inch 3.14. The 16 inch footing would support exactly the 3600 pounds from the example above. 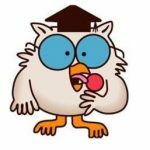 However – lots of places in the country have snow loads (which the footings must support) and many buildings are wider than 30 feet, or have columns placed over eight feet apart. Trying a 40 foot span, with a 40 psf roof snow load, same eight foot column spacing, would mean resisting an 8000 pound load! With 1500 psf soils, even a two foot diameter footing would be inadequate. In most cases, the use of concrete cookies as footing pads proves to be both inadequate and a waste of good money. 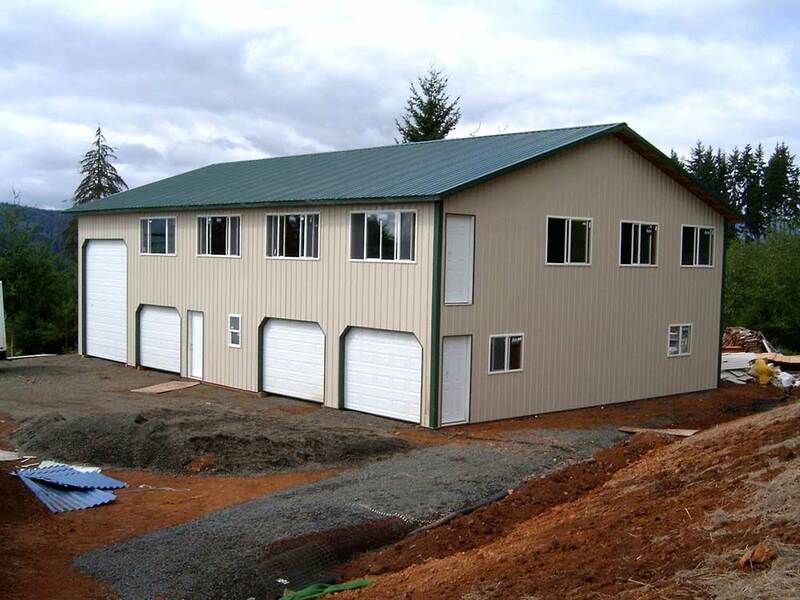 To insure a building won’t settle, (from inadequate footings), look for a plan produced by a registered design professional who is proficient in post frame building design. He/She will have the history and training to design your building to withstand the loads…which begins with the foundation. 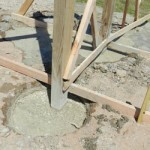 This entry was posted in Constructing a Pole Building, Pole Barn Structure, Concrete, Concrete Cookie, Footings and tagged Pole Building Design, pole building concrete, soil compaction, concrete foundation, concrete floor, Concrete on August 7, 2012 by admin.